One company is finished with a big change. The other is just beginning to fix a big mistake. Some of the best stories in the stock market are about companies going through big changes. Freeport-McMoRan Inc. (NYSE:FCX) and Alcoa (NYSE:AA) both fall into that category, but they are in vastly different places at this point. And while Freeport is making admirable progress, and its outlook is increasingly bright, Alcoa is growing on a much more solid foundation. Here's why investors are better off buying Alcoa now that it's separated from Arconic (NYSE:ARNC). Alcoa employees at a work site. Image source: Alcoa Inc.
Alcoa's core business is making aluminum and related products. However, leading up to the 2016 breakup of the company, it had started to build a specialty parts business. That division is now the stand-alone company known as Arconic. Creating that parts business was the big news at Alcoa, but there was plenty going on besides that headline. Most notably, while Alcoa was developing the specialty parts business, it was also streamlining its aluminum operations. It shuttered or sold higher-cost plants and mines, and improved its operations. The end goal was to take a more than 100-year-old aluminum company and prepare it to better compete in today's world. To put some numbers on that, the company moved from the 51st percentile on the aluminum cost curve in 2010 to the 38th in 2016, and from the 30th percentile in alumina to the 17th over the same time span. A lot of hard work went into that, despite the fact that investors were spending more time looking at the growing parts division. The company's not done upgrading for a new world, but it's well along the way. Freeport's big change really started a few years ago, when it spent roughly $20 billion to buy its way into the oil and gas business. That expanded its reach from copper and gold into a new commodity, but at exactly the wrong time. When oil prices started to fall in mid-2014, the move suddenly looked like a huge mistake that saddled Freeport with a massive debt load. FCX Total Long-Term Debt (Quarterly) data by YCharts. The company has been working back from that decision ever since. 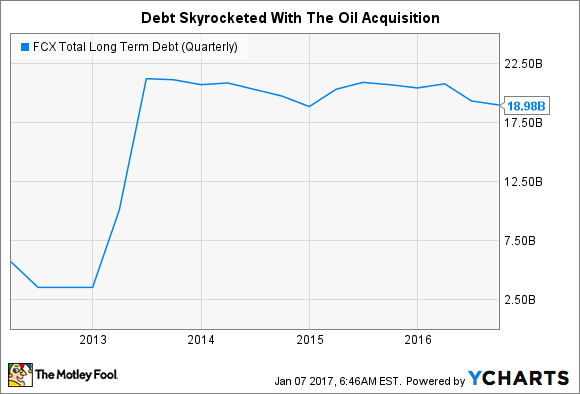 But 2016 was a turning point, with the company finally making some real headway on the debt front and in its efforts to get out from under oil assets it didn't want. This year should see a material deleveraging of the balance sheet if the company follows through on its promise to keep reducing its debt and if commodity markets cooperate. Where each company goes from here is decidedly biased by the events outlined above. For example, although Freeport's outlook is brighter than it has been in several years, it still has to deal with the debt hole it dug with the oil acquisition. At the end of the third quarter, long-term debt still accounted for around 80% of its capital structure. In fact, even if the company achieves its most aggressive debt reduction target in 2017, paring down debt to some $8.4 billion, debt will still make up around two-thirds of the capital structure. That's back-of-the-envelope math using uncertain forecasts, but if it's even in the ballpark, debt will still be high for a company reliant on often-volatile commodity prices. Compare that to Alcoa, where there's long-term demand underpinning its business as the world increasingly focuses on energy efficiency. Aluminum is prized for its combination of strength and light weight and is even displacing steel in the cars we drive. In fact, there wasn't enough of the metal to go around in 2016. The outlook for Alcoa's industry is for long-term growth, even if there are bumps along the way. China is making more aluminum than it needs, but the rest of the world isn't. Image source: Alcoa Inc.
And now that Alcoa is a stand-alone company, it's working to take advantage of that opportunity from a very solid financial position. Long-term debt makes up less than 20% of the company's capital structure. In other words, Alcoa is building from a position of strength, while Freeport is still trying to fix its financial foundation. Freeport-McMoRan is finally starting to make some real progress in working its way back from an ill-timed investment in the oil sector, but Alcoa is much further along in its big transformation. Indeed, after separating from Arconic, Alcoa has a solid balance sheet and is addressing a market that has encouraging fundamentals. Unless you are specifically looking to buy into a turnaround in the making -- and all the opportunities and risks that come with that decision -- Alcoa looks like the better option for most investors.